HomeOffice Plants Tips & IdeasArtificial Plants – Are they an option for my office? Why choose artificial plants over live plants? There are many reasons. Insufficient light for live plants is the main reason we recommend artificial plants. Offices in downtown high rise towers can be very dark. Even buildings with large windows can be dark if the natural light is blocked by other nearby buildings. Our clients often want plants in internal areas that do not have any windows. We strongly discourage using live plants in these situations. Our goal is to ensure our clients have healthy, thriving plants and we know from our many year’s experience that live plants will quickly deteriorate in low light. Artificial plants require very little maintenance. They will need only periodic cleaning and reshaping. Although high quality artificial plants cost a bit more than live plants to purchase, there is a cost saving as weekly maintenance is not required. Often a client would like plants for an area that is not easily accessible for the weekly maintenance needed for live plants. This could be a meeting room that is often occupied, or a planter that is out of reach for some reason. Artificial plants are a great solution in these cases. Artificial plants and trees can be custom manufactured to any height and width. This offers more flexibility in design. Because they do not require light, any type of plant can be used in any area. Trees that cannot survive indoors, such as those native to Ontario, can be replicated and installed anywhere. 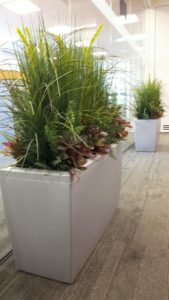 A growing number of the plantscapes we design consist of both live and artificial plants. This gives our clients the flexibility to have greenery everywhere in the office. Our trees are custom made using real wood for the stems and premium foliage. We supply the artificial plants and trees in the same containers that we use for the live. This gives a cohesive look to the plantscape design and ensures that the artificial greenery does not look obviously different from the live plants. Want to see more of our plants and trees? Have a look at our artificial plant gallery.